As stated in the Preface, there is a dual focus to this new collection edited by Greta Olson and Ansgar Nünning. On the one hand, the book aims to offer students as well as other readers compact information about some of the most important and fruitful approaches and methods that have recently emerged in the field of literary and cultural theory (p. i). 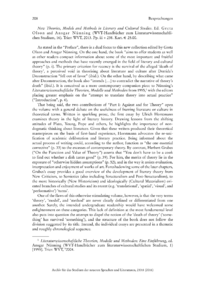 The primary criterion for recency is the survival of the alleged death of theory, a perceived void in theorising about literature and culture after Derridas Deconstruction fell out of favor (ibid. ).